My downstairs neighbor had her quarterly check-up at the Cancer Center today and I took a later train than usual so we could go downtown together. I made sure to put breakfast on the table and leave the Tupperware and chopsticks that J and M needed to take with them for their post final exam rice cake pounding event before waking J up with instructions to wake everybody up in time for school. My neighbor and I managed to arrive at the hospital a little after 8 a.m. and go our various ways for check ups and treatments. Her survivor friends also scheduled their appointments today so they could get together. They kindly invited me to lunch with them when I met them after my treatment just as they were finishing up with Dr. F.
Thinking that the kids were already home as both schools got out a little early today, I decided I'd go ahead and join the ladies for lunch as it was already too late to rush home and be here before they got home anyway. We had a pleasant time and my neighbor and I got home around 4 p.m. to an empty house as the older girls were at club or team practice and the elementary kids were out in the park with friends. I noticed the answering machine light flashing so I pressed the button to hear "This is Mr. H. from junior high school. Neither J nor M have arrived at school this morning..."
That's when I found the uneaten breakfast on the table and deposit of pyjamas, discarded school uniforms, dirty socks etc. scattered over the yet to be folded and put away futons. Guess I should have called the kids from the hospital instead of assuming they were all already in school. Oops. I called the school to make sure that the girls had arrived in time to take their exams and was told that they had arrived with a few minutes to spare, just after the teacher had called. Whew! S went to help out at the rice pounding event, kindly taking the necessary Tupperware and chopsticks that had escaped notice in the apparent rush to get out the door. J said that there was one 7th grade boy running a few hundred feet behind her as she ran in the front gate so she was glad that she wasn't the latest kid. I gave a sample for my blood work this morning and was promptly called in for my check-up. My oncologist had printed out results from my Ct scans of July and of last week to show me how much the Taxol (the ultimate head lice control drug) had shrunk the tumors in my lungs. This was encouraging. He asked about all the possible side effects and examined my hands, checked for lumps, listened to my breathing, looked carefully for any swelling and asked about the general quality of my life to determine if the treatments have been affecting my quality of life. We discussed extending the Taxol treatments until I notice more side effects and he typed in a schedule for up to 26 treatments in the computer. So far, the only side effect that is worrisome is the gradual numbing of my feet. For some reason, my hands haven't been affected yet (knock on wood) but my feet feel like I've been skiing all day and my old (not very warm) ski boots were buckled too tightly. This isn't really a problem as I've always been a little clumsy and as long as I wear my SAS shoes or other well cushioned sports shoes, I'm OK. If this neuropathy advances to a point where it changes my gait, I will probably stop the Taxol and, per the original plan, keep up with the Herceptin. There goes the 20 time countdown goal. I asked to see the bone scan results from a few weeks ago and he showed my that my skeleton had a little illumination on a spot on my upper left rib cage and another spot on my right hip that weren't there last November. As I have no symptoms (pain) the current course of action is to stay on the Taxol/Herceptin menu and keep an eye on the spots. These scans detect trauma (breakdown and regeneration) to bones and it might not necessarily be metastases to my bones and could be a number of things (I am a little clumsy and could have bumped my hip and the rib cage spot was radiated two years ago...). I need to research a little more. I tend to think that it is cancer spread, but feel that the Taxol is probably working on this too. Not shattering news, but still a little dismaying. I walked around Shinjuku Station and Yoyogi today to get my exercise and look at the hundreds of men setting up billions of Christmas lights the Takashimaya Times Square area. What a lot of electricity and manual labor for a generally Shinto/Buddhist metropolis. J and I left breakfast and lunch on the table with a note for the younger siblings and S who were sleeping when we tiptoed out the door at 8 a.m. to go to a musical instrument fair in Yokohama. Getting everyone out the door in time and dragging them to Yokohama would have detracted from fun for the day all around (J would have had to rush through the exhibit so we could get out before the other three broke anything and they would have been grumpy about tagging along when they could have slept in) and increased our total round trip time ("Where's L? OK, now where's N?...."). Our student/sometimes helper and his sister came over in the afternoon to play with the younger kids and the kitten, so they weren't at all unhappy about being excluded from the day trip. We checked out Xaphoons (handmade bamboo saxophones from Maui), ouds (guitar-like Middle Eastern instrument with beautiful mother-of-pearl inlay and 11 strings), saz lutes and all sorts of unique instruments as well as a plethora of mainstream instruments and accessories. J was most impressed with the contra bass saxophone in this photo. There are apparently only four of them in Japan and this is the only privately owned one. The other three belong to various symphonies of bands. 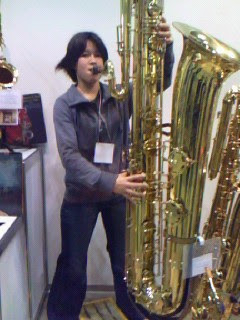 She was ecstatic when the people at the booth kindly encouraged her to play the monster sized sax. She actually managed to play a song from her brass band fall concert program, but it was hard to get the sound on the video of my cell phone as the very large conference center was filled with booths of other visitors sampling instruments and the low frequency output of the huge instrument couldn't compete with the din of clarinets, trumpets, alto saxophones etc. She had a great time. We arrive home to sit down and play with Koro and her guests who were kind enough to bring Baskin Robbins ice cream. It looks like I'm tolerating this stuff fairly well and it is working (hurray! ), so the plan is to stay on for a while longer, possibly up to 20 times, so I should start growing some hair around Christmas. Next week is my Taxol break and I'll have a Herceptin only day so I've scheduled my quarterly cardiac ultrasound then too to make the most of the trip to Tsukiji. S's brother and family will be visiting on the Sunday afternoon after that so I'm glad I'll have a little more energy next week. M will be in a city-wide track meet on Sunday so I expect we'll take a picnic lunch and enjoy what we hope will be fall weather. It has been so hot that J still has swimming in gym class this week. M's teachers have been asking her lots of questions about me lately, trying to scope out whether or not I'd make good lesson material. She confirmed that I could probably manage to speak in Japanese and that I'm not a terrible cook, among other things. I must have qualified; I had a call today from the head of the year asking if I could participate in a general studies session/event on Sunday October 21st during a school open house and talk to the 7th grade about my first impressions of Japan and provide a recipe (and probably the actual cutting and cooking) for a "foreign" food that can be cooked over campfires behind the school and consumed at lunchtime with rice. I suggested a big pot of minestrone soup, thinking that it might be economically feasible and epicurically (I know, it isn't a word, it just sounds like one) tweak-able to a simple enough flavor that the students won't waste the entire pot just because of too many tomatoes and a little oregano. It might not be particularly American, but neither is chili, either of which were more likely to be approved than Rocky Mountain Oysters (bread crumb clean-up is pesky and the hot oil is too scary over an open fire...even if I could find the proper ingredients locally). They liked my idea and will be in touch with me again after they recruit a few other parents for manning the fires, chopping, stirring etc. They're hoping I can bring a few friends from other countries to talk about food and culture and things which may have surprised them when they first came to Japan too. I said I'd ask around but that most of my friends might not be available on Sunday or, if they were, might not be able to contribute to the menu. So...any takers? Saute carrots, cabbage, celery, onion, bacon and garlic in oil for 5 minutes. Add water, tomatoes and bouillon; bring to a boil. Reduce heat. Simmer, uncovered, for 20-25 minutes or until vegetables are tender. Stir in macaroni, salt and pepper; heat through. J is in the second of three years of junior high school. 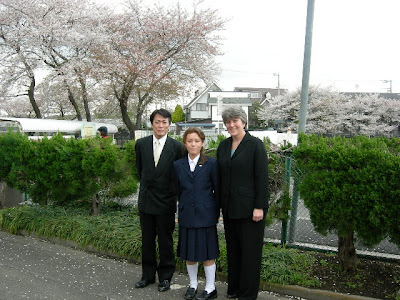 That's as far as mandatory education goes in Japan and, although public high school education is available, entry to high school, public or private, is determined by rigorous entrance exams. This means that there is a variety of schools to choose from and that most of the nice ones are a bus or train ride away. 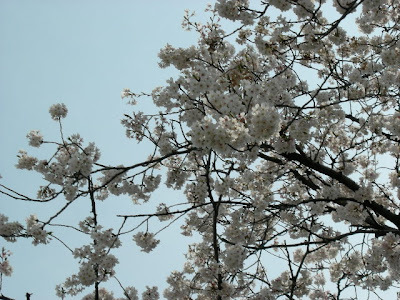 It also means that J needs to check out a few schools to see what she wants and figure out where to focus her studying over the next year and a half until the entrance exams (each school has their own $300 entrance exam so we'll try to whittle it down to a challenging school and a shoo-in). Hopefully she can qualify for and want to attend the better public schools as they only cost about $2,500 a year in tuition and other costs plus whatever the textbooks will cost that year. Private schools are three to four or more times that plus fees for uniforms. Last weekend many schools had open house / school festival events so we went to three high schools in three days to do our scouting a little early. There were many anxious looking 9th graders checking out the schools as well. They'll be taking exams in early February for April matriculation. Of course we had to take N and L with us and there were lots of fun things for them to enjoy while we checked out each campus. 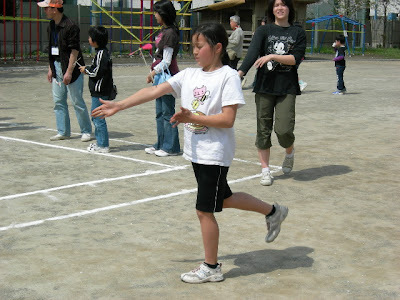 Some of the classes had organized games or scare house fun. L insisted on going through the haunted house at one school but begged me to go with him. We were handed a flash light and directed into a dark classroom where all sorts of things popped up in front of us as we made our way through, thoroughly scaring him. The "ghosts," all 10th graders, had trouble not smiling when they saw how cute he was, so it wasn't all that terrifying though. One even apologized for jumping out a few seconds too early. "Boo! ...Ooops, sorry." M didn't have track practice that day, so she came along with us and seemed to be inspired by how fun high school looked and how outgoing the students there were. She'll have to work a little harder if she wants to go there because it is one of the more competitive schools to enter around here. Somehow a picture of me in my beanie at the PTA coffee shop showed up on the school's website. Ugh! The kids got to try tea ceremony at another school and learn more about taking trains to get around. We stopped by a station with a discount shoe store on the way home on Sunday and got L equipped for his fall season of running away from all the girls and had lunch at a cheap spaghetti restaurant where N spilled a large iced tea all over herself and the floor, prompting the kind staff to quickly mop the floor where she then proceeded to noisily drop her silverware. Wet and embarrassed, she was a perfect little lady for the rest of the meal and we bought her a new outfit at the post-summer clearance at UniQlo nearby. $5.00 for a skirt and a T-shirt and she even looked like a little lady. I carried her raggy and wet favorite sportswear home in a plastic bag. Of course the next morning I had to leave for the hospital on a later train than usual because S was away and I had to make sure that everybody was up and ready to go off to school before I left so I decided to make the detour on my way home instead. I managed to get to the hospital by 8:30 and my doctor saw me at the reception desk on his way by so he went and got my files to approve them and send me on my way for treatment before his first appointment. I was finished by 1:00 p.m. and back on the train soon after. A few stops, a transfer and 20 minutes or so later found me at the very far end of our train line where N's bag, complete with about $30 and her library card, was waiting for me to sign for and take home. There was also a vegetable stand right in the station selling the local produce so I bought some nice big potatoes for baking and a big bag of fresh tomatoes for a very good price. The cheap and fresh veggies made up for the extra train fare and I was back home by 3:00, a few minutes before L walked in the door from school. N was very happy that her bag came home and only complained about a few pieces of origami paper she thought might be missing. All were happy with their baked potatoes for dinner. Next weekend we'll visit a few more schools and spend some time at the Shinto Fall Festival in the street near our house on Sunday. J is off every day to a movie prop company in the neighborhood on a three day work experience for school. She was impressed yesterday with a large storage area full of nothing but samurai headgear and another room full of books in foreign languages for use on TV show sets. It sounds like most of the work she and three other classmates are doing is lifting and carrying. The worst of the typhoon was during the night and we had no worries in our big concrete building. There was a cyclone about half a mile away from us and that neighborhood was out of power overnight because the electric company couldn't make repairs in the typhoon. The children were happy to sleep late on Friday morning and the sun came out as predicted, that afternoon. Today's after-school activities have all been cancelled and the students have been sent home promptly as the edge of this season's ninth typhoon has reached Tokyo. Heavy winds and much rain are expected when the main part of the storm hits Tokyo around 7 p.m. today so I rushed out and stocked up on beer for S. The children each came home with a letter informing me that school will not be canceled but rather postponed tomorrow so they don't have to walk through the worst of the wind and rain which is scheduled to stop abruptly at noon. M has made the transition from U.S. East Coast time to Tokyo time very smoothly. We made sure to keep her awake until at least 9 p.m. and sent her to track practice the morning after she returned. She had no trouble waking up early this morning to go to a track meet with her team by train and bus. She wasn't here when the coach registered everybody so she and a few other team mates who missed a few days of practice won't actually participate, but they're expected to go to the meet anyway as "practice" for another meet that they will be in at the end of this month. I was a little tired from the trip to Narita to get M plus the usual late nights and early mornings. I was up a little before 6 this morning to make a lunches for M to take with her and for the rest of us to take with us as we had plans to celebrate the end of summer homework pressure by ignoring the homework and going swimming with friends. The pool wasn't too crowded as most kids were probably home slaving away at their homework. Tomorrow is more lunches and more places; M will go to the second day of the track meet to cheer the team on and we'll cycle over to cheer S on at the second half of the citywide PTA softball tournament. In the afternoon we'll pack up all the school stuff so each child can grab it and take it all back to school on Monday. It will be nice to have more space on the floor and no crustaceans in tanks among the jumble of shoes in the entryway. We'll get all the futons out and make some dinner for S (who will be off teaching in the evening) before we leave for the evening soccer game so we can crash as soon as we get home and be ready to wake up and start the second trimester of school and the fall routine. Whew! I've been a little busy since Tuesday and haven't had time to post. All is well and I'm off this morning to pick up M at the airport when her flight arrives around 3:00. My parents called to report of her safe departure and had all sorts of heart warming compliments that made me awfully proud to be M's mom. The siblings made a "Welcome Home" banner to hang on the wall and we'll have roll-your-own sushi rolls for dinner tonight to celebrate. I hope that M will be able to stay awake for dinner. We're all looking forward to seeing her today. The street in front of our house was closed for a few hours this afternoon for the annual YOSA KOI Dance Parade. The local commerce committees of neighborhoods at either end of the street hosted street party festivals and we spent the day being entertained and nibbling on barbecued seafood. The kids were in a contest to see who could drink a bottle of fizzy soda called ramune http://en.wikipedia.org/wiki/Ramune the fastest to win two seats at a soccer game on Sunday night. My son finished first in his group of 6 1st and 2nd graders and then my daughter finished first in her group of 3rd and 4th graders so we now have 4 "SS reserved seats" at Ajinomoto Stadium in western Tokyo for a J League professional soccer game between Tokyo Verdy 1969 and Thespa Kusastu. It's nearby so I may send the kids alone if they're all ready for school the next day. I could wait outside at a cafe. We were given some tickets for a neighborhood raffle. The prizes were donated by shops along the street where we live so they ranged from coupons for free massages at a neighborhood clinic, 11 lb boxes of greenhouse tangerines, autographed soccer goods, household electronics, cosmetics, coupons for yakitori chicken, rice crackers, a digital flat screen TV, a fancy semi-powered bicycle, 22 lb bags of rice etc. Friends and I laughed about how much we'd appreciate some of the prizes and which prizes we didn't really need, like a hair dryer or 30 lbs of kibble (not much hair, no dog). The drawing began and a neighbor was the first to win a 5,000 yen box of two deluxe watermelons. We only had a few tickets and didn't expect to win anything but were enjoying the afternoon breeze and just being out with friends. It was a very big surprise to hear our number being called for the next prize, which was......drum roll......the hair dryer. I and my friends whooped with laughter as J went up to pick up our new powerful 1200w professional-use beauty tool, retail value 8,190 yen. It is probably nicer than the dryer we already have which nobody ever uses but we've decided to put it up for sale in a local Tell and Sell Yahoo group. I think it would blow what little hair I have right off. We're down to the final few days of summer (but not necessarily the summer heat) and will spend this week shuffling stuff around the apartment making sure all the back-to-school things are in order and that space is cleared to make room for M's return. L will spend this afternoon finishing up his summer homework so we can check it, put it in his school bag and forget about it. N will have a friend over to complete their joint origami project and torment L.
I took N and L with me to a foreign wives coffee morning and was glad to see some nice ladies and hear how their summers have gone. Having the young ones with me meant that I didn't have to rush home to feed them lunch so we did a little shopping with some department store coupons I'd been carrying around for a while and bought some dinner ingredients and a little gourmet ice cream to treat them for being generally well behaved. I spent the rest of the day tying up loose ends on a few jobs, taking L to the dentist and cooking dinner. The school pool will re-open for a final week of swimming fun tomorrow so I won't have to work so hard to keep N and L entertained. Nine days until M returns. We are all anxious to see her soon. Cousin Richard sent some photos from a family gathering and we were glad to see that all look well. Today's trip to Tsukiji was uneventful. It was a little busy this morning and I had to wait a little after my consultation with Dr. F. before my blood test results arrived on his computer. He saw a few patients after my exam and called me back in when the results were available to ask a few more questions and send me on my way upstairs to the chemo room. It was almost 11 by the time a recliner opened and my costly cocktails were mixed and ready for my IV to begin. I watched a Steve Martin movie on a DVD player, both borrowed from the nurse station, during my Herceptin hour and napped on steroids for my time on Taxol. I walked out of the gentle airconditioning of the Cancer Center into the wilting Tokyo summer heat and swam through the humidity a hundred yards to the subway station and its cooler underground air and highly airconditioned trains. Now I'm at home on the 7th floor with all the windows and doors open, catching late afternoon breezes and thinking about actually starting on some of the translation work which has a Thursday deadline as well as about what to do for dinner. Harry Belafonte is telling Senora to shake shake shake, jump in "de" line and rock her body in time and the steel drums and calyspo are helping us pretend we like the weather. L brought one of the second grade crayfish home to take care of over the summer. It had grown considerably since its capture over a year ago when the then first graders hiked to a nearby agricultural high school's experimental farm to fish for the creatures in the farm pond, which must have been stocked for that purpose every single child managed to catch one...The students who didn't want to keep a crayfish as a pet at home let theirs go back into the farm pond and each group of four or five students adopted one to keep at school and observe. The clear plastic case had a list of names of the children in his group who usually take care of feeding the crustacean and cleaning the cage during the school year. None of them volunteered for the summer job so L brought the case home with him on the last day of school, along with a plastic bottle with a baby crayfish for him to keep, and did a fairly good job of making sure the water was changed and food was offered regularly with a little help from N. His friends asked about the crayfish from time to time, making sure that their group still had a crayfish. Well...while we were off on our annual camping trip, the balcony must have gotten too hot as both crayfish failed to survive three days of neglect, even though we'd tried to shade their cases to keep them out of any direct sunlight. L was very sad at the loss and also worried about what his group would do without a crayfish. We decided to tell his friends about the demise of their crayfish and ask them if they felt we should take some chunks of squid on string to try to catch a new crayfish for their group to observe. They all agreed that they were sorry to lose their original crayfish but that they still wanted to care for a crayfish at school from September. So...N, L and I headed off on our bikes for L's first (very wobbly) on-road bike ride to see if the ag. school farm about a mile away was open to the public or not and if we could catch and keep a crayfish or two. The teacher in charge told us that usually they don't allow the crayfish to be taken home as it would be a problem if people let them go in local rivers and the crayfish population became a problem. When I explained the situation, he agreed to let us catch two to take to school in September. Whew! Now L will write about his exciting first bike ride and the crayfish crisis as part of his summer homework. I arrived at the National Cancer Center early and had to wait a while for the reception desk near the examination rooms to open so I could give them my patient card to get my charts and have my oncologist authorize the day's treatment. A few minutes before the offices opened for the morning, my oncologist came striding down the hall and gave me a big smile on his way to his examination room. He must have decided that I looked well enough for treatment because he came back out of the "authorized personnel only" area a few seconds later to ask me for my bar-coded patient card so he could personally access the hospital computer and authorize my treatment a few minutes early. The receptionist was surprised to see me already on my way up to the chemo room on her way to the reception desk and I was finished with treatment early enough to enjoy a leisurely lunch with one of the wonderful women who have been encouraging and supporting me through these treatments. Now I feel very refreshed and am ready for for our annual camping trip, except for the picnic lunch that I should be making as I type...Okay okay! I'm on my way to the kitchen and beyond. As expected, the CT scan I had last week showed that all the tumors in my lungs are much smaller. My doctor asked all sorts of questions to determine if I've been experiencing any neuropathy, did a manual and visual exam to make sure I don't have any lumps or swelling where I shouldn't and carefully inspecting my fingernails (which aren't particularly more brittle than usual) and finally we spoke of future plans. Other than a few creepy crawly feelings across the top of my feet once in a while, which could be short hairs landing after a gentle descent from my still thinning breeze-catching coiffure and blowing away before I actually see them or could be the beginning of temporary nerve damage, I haven't noticed any nerve troubles so far. No palpable or visual troubles were found. 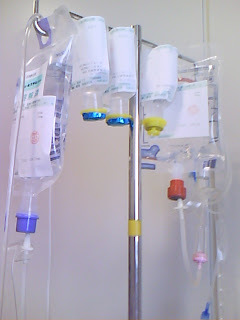 Next week is Herceptin only and then the following three weeks will be more Herceptin and Taxol, another Herceptin-only week and then three more Herceptin-Taxol weeks before returning to the weekly Herceptin maintenance regime. He asked about my summer plans to see if any rearranging in the treatment plan might be needed and also let me know that he'll be away on the 23rd of August but that another competent oncologist would look at my pre-IV blood work and authorize the treatment for me. I slept through the entire I.V. and had to splash my face with a little water to perk myself up for the train rides home. I was back before 3:00 and off to school to pick up some forms from City Hall for L's upcoming dental appointments. He had a few cavities according to the school dental exam so we'll take care of that over the summer. J arrived home from Canton last night so we made pizza tonight to celebrate and let her have something that wasn't Asian for a change. The three of them are watching a DVD from a set of three that she bought for about 300 yen in Canton which has 140 Tom and Jerry cartoons in it. The disks have Chinese and English soundtracks and subtitles which can be selected accordingly. She had a great time with her classmate's relatives. Now she has to settle into the rhythm of summer in Tokyo, which is cooler than Canton but still hotter and more humid than I prefer. N and L have been falling asleep very early this week because of their strenuous playing and swimming every day. We spent a few hours at the elementary school summer festival to cool down yesterday evening but decided to skip the second evening there and relax at the city pool in the afternoon instead. I was careful to wear a swim tee-shirt and lots of sunscreen. We enjoyed cool and colorful shaved ice at a stand after our swim. L is getting a little heavy for the back of my bike, especially back up the big hill on our way home from the pool, but he's still not quite ready to ride his own bike outside of the local park just yet. N and L are looking forward to J's return on Monday, expecting souvenirs of course. With N busy all morning with softball and swimming, J and M away and S off teaching all morning, L decided he'd rather go with me to Tsukiji than sit around home alone until his afternoon swimming so he took the 6 a.m. train with me to Tsukiji. We had seats on both trains all the way and had a little time to go up to the 19th floor of NCC to enjoy the view before I started on my round of blood draws, a consultation, a CT scan, pre-payment of today's bill, shopping for more tea to go with our onigiri (rice balls) and the weekly Herceptin-Taxol IV. He was very curious about all the needles and got to watch all six stabs I got today. It should have been 3 stabs; one for the blood draw, another for the CT scan contrast and then a final one for the IV. My veins were not cooperative today and the CT scan tech needed 2 tries and and so did the chemo room doctor and then we had to switch the treatment IV after the first Herceptin part as it was leaking outside of the vein which would have been a big problem if it had been the more caustic Taxol. I ended up letting the CT scan tech and the chemo room guy use my surgery side arm to save a few veins in the usual IV arm. This is a no-no in terms of lymphedema (swollen arm) prevention but I figure that the arm has survived without much lymphedema for two years and eight months my arms were covered with tufts of sterile cotton and clear tape by the time we finished. L borrowed a DVD player and some DVDs from the reception desk and sat at the end of my bed to enjoy "Toy Story" and "A Bug's Life" while I relaxed with my drip. He managed to eat his lunch and snacks without mashing too many crumbs into the sheets and only spent the final ten minutes spinning around and around on a nearby stool out of boredom. We stopped by at a friend's house on the way back for coffee, conversation, creme brulee, and a book exchange. L was very glad to play with a friend and shyly impressed by the friend's pretty three year old sister. I was glad for a chance to do something social to break up the day. Very refreshing! On the train on our way home, I heard someone call my name and looked up to see a former colleague sitting across the aisle from us. It was a pleasant surprise to see her after 14 years. She's still working at Sogo (my old company) and had heard of my ongoing treatments from Mrs. K., the boss' wife who came to Chofu for coffee and catching up last month. We re-exchanged phone numbers and said good-bye at Chofu Station where L and I got off to rush home to N.
N did a good job of holding the fort down this afternoon and was rewarded by the arrival of a child sized softball mitt from a kind and generous foreign wife friend in one of my Yahoo Groups (Thank you R). She did take a three hour nap after her morning exertions but it looks like she'll be ready for bed by 8:30 tonight, as will L.
As I only had Herceptin last week, there was no need for a blood test this week to monitor my white blood cell content so instead of seeing my doctor for a pre-chemo check-up, I was supposed to just ask the nurse at the examination room reception area for my file and continue on up to the chemo room for my treatment. It always takes five to ten minutes for my file to be produced and the nurse to confirm that "yes I feel fine" and there have been no problems over the past week. I was lightly snoozing in my chair near the reception desk when I heard a man's voice call my name. My doctor had brought the file out himself to tell me that he'd scheduled me for a CT scan at 10 a.m. next Tuesday and warn me to skip breakfast until after the scan. I'm looking forward to seeing how the Taxol is working. If the results are good, I won't hear about them until the next week's consultation but I expect he'll call if there is any bad news so we can re-group and plan the next strategy quickly. This is a month earlier than I expected to get a peek at my lungs. I have energy today so I finished up some translating work, went swimming and did some shopping before logging in and frittering the afternoon away on the Internet. Class as usual tonight and then tomorrow I take M to Narita on the early morning bus for her flight to the States. Her suitcase is ready to go and we just need to find something appropriate to wear on the journey. We're in the middle of a very wet three day weekend before the last four days of school and then summer vacation. A friend is here and they're all playing well together. I would enjoy summer vacation a little more if it were indeed a vacation. The kids are expected to go to school every day for the first two weeks for swimming lessons and the junior high schoolers are expected to go to club or team practice every day. They'll all have loads of homework to be turned in on the first day of school in September. N has signed up for the summer softball team at the elementary school and practice is every day from 6 to 8 a.m., before swimming. The tournament is on August 19th so she won't have practice the last two weeks of summer vacation. I'm wondering when we can fit in some quality summer fun. I'm sure we'll manage somehow and that I'll be glad when school starts again (mainly that I won't have to think about what to feed everybody for lunch everyday, even noodle lovers can tire of cold noodles). In order for me to continue to tolerate Taxol for as long as possible, I'll be taking a break after every three treatments. This week was my first break and I went in on Tuesday for Herceptin only instead of Herceptin and Taxol. I started early and finished early and was home again by lunchtime. I feel much more energy this week so I guess the Taxol was a little more taxing than I'd thought it would be, but tolerable. Last week and the week before I had to drag myself out to walk or get errands done but I could get out and around. I felt great today so I went to the gym to swim a little. After I showered and stretched I noticed that the water level in the pool was down about a foot from the usual level. The usual little old ladies walking and swimming their laps splashed away as usual but all had to stop and laugh when big old Kathy stepped in and the water only came up to my hips (I was laughing too, thinking that my very presence raised the level a little for the rest of them). I managed to swim for forty minutes before heading off to the showers and bath. It looks like there will be some maintenance in August so I hope they fix whatever the problem is. Then I tackled the huge pile of laundry and sorted out clothes for M to pack for her upcoming trip next week. I accomplished quite a lot and actually found the floor in the back room. Now I'd better stop writing and get some dinner on the table before going out for my Wednesday evening classes. I appreciate the nice air conditioning all morning on Tuesdays these days. This morning I had an X-ray scheduled for 8:30 a.m. so I took the 6:30 train (before it got hot) and arrived at 7:30 to avoid the crowds and register for my pre-consultation blood tests and get the x-ray over with ASAP. I finished all the consultations and treatments by 1 p.m. and was home a little after 2. The x-ray showed that the Taxol has been shrinking the tumors a little. Next week is my Taxol break and I'll only get Herceptin because taking a rest after every three treatments should keep me in shape enough to continue the Taxol longer. My scalp is feeling a little tingly and there is lots of hair on my pillow in the morning but I look no different in the mirror. The white hair seems to fall out first, I guess because it grows faster than the brown hair so the Taxol attacks the fast growing cells. I wonder if they should up the dosage to accommodate for all the Taxol that goes to my overabundance of hair... :-). I think I'll try to get early appointments all summer so I can be home when the kids are home in the afternoons. The calendar shows a three day weekend at the end of April and a four day weekend from May 3rd. We've closed our language school for the week even though the kids still have school for two days this week. M's U.S. passport has just expired so we need to take her downtown during embassy business hours (the embassy has both U.S. and Japanese holidays so they're only open Tue. and Wed. this week) to apply for a new one pronto. So much for a perfect attendance record at jr. high, she has to be present when we submit the application, as do both parents as she is under 14 years old and the passport agency is trying to avoid international abduction issues. If only one parent can go, an expensive notarized letter with reason for absence and notarized permission to apply for a passport for the minor is necessary. The nearest U.S. style notary is AT THE EMBASSY...Japanese facsimiles of notaries charge about a hundred dollars for each signature. Actually, J and L's passports have also expired but N's is valid until the summer of 2008. With no immediate travel plans, I think we can wait until summer vacation so we won't have to keep them out of school for a day to apply in person. I think that the embassy notary can notarize the necessary forms free of charge so S won't have to go all the way downtown again. J will be 14 by then and no longer need permission from either parent (Yeah, sure...J: Arrivederci! I don't need you old folks, I'm off to see the world.) I'm glad that we managed to talk S into a trip downtown anyway. With treatment on Tuesday and the embassy on Wednesday, I'm getting out and around a lot these days. 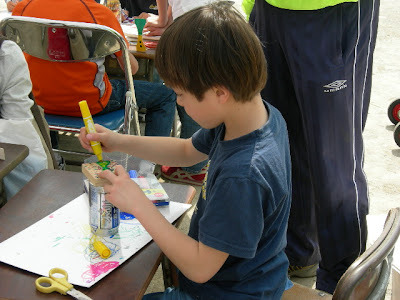 Hopefully we can go do the pool with the slides that everybody likes or cycle over to Nogawa park with a basket full of rice balls wrapped in seaweed on Thursday or Friday so the kids can say they actually went somewhere or did something during Golden Week. I think I'm getting used to this weekly routine now. I manage to find the right part of the train where I'm likely to get a seat in the morning rush, make the transfer to the downtown subway smoothly and not forget to get off the train at the station near the National Cancer Center (only forgot twice, suddenly remembering "Hey! That was my stop!" just as the train doors close and the train pulls out). That seems to be the worst part of my Herceptin treatments. The treatments themselves are pretty simple; hand my file to the chemo station staff, take the escalator back down to the reception lobby where I can pay my bill in advance at the accounting counter which is not yet busy in the morning, get a bottle of green tea, return to the chemo room to be assigned a chair, get set up for the IV and sit for an hour and a half in a nice reclining chair sleeping or reading while the drug and a saline solution chaser drip. As soon as I'm done, I can go right out the door and get the train home instead of waiting for 20 or 30 minutes at the busy accounting counter to pay my bill. The subway and train home are not at all crowded so I can sit and finish my book. It takes about an hour one way and I'm usually home for a late lunch and a short nap before the kids come home from school. Well, the good news is that the ugly spots in my lungs are no larger than they were 6 weeks ago (the largest of the five I could see in the x-ray is about 6cm long and 2 cm wide) and may be a little smaller even. Also, I remain symptom free unless anyone looks at me with X-ray vision and sees the blobs. It isn't as encouraging as I'd hope it would be but women in a Herceptin support group said that basically this is what to expect. Their mets shrank with additions of other chemotherapy drugs to the Herceptin. As I am not lacking oxygen or getting palpitations, I'll wait until after May's CT scan before possibly starting with more chemo with my Herceptin. I'm glad that the Herceptin has stopped the advance of the cancer in its tracks and will continue with treatments to keep it that way. I used my postal account for today's treatments and was comforted to see that more friends have contributed to my treatments. I really appreciate everyone's generous support through messages and contributions. Today's treatment went well and I got home earlier than expected so here I am on the computer. I finally got over last week's cold and am ready to go tomorrow for an x-ray to see how the Herceptin is working and to get my weekly dose of it. I guess I'd better plan an easy breakfast and lunch for the kids who won't be up when I walk out the door or who will be home for lunch because the junior high doesn't begin school lunches until Wednesday. Three out of four returned to school today for a morning. M's entrance ceremony will be on Monday. I have a very nice Anne Klein black pants suit to wear as a lovely woman in the breast cancer survivors yahoo group I joined decided to cheer me up with a box full of nice clothes and even some treats for the kids. M will wear her new school uniform, which is the same as J's but a few sizes smaller. I'm glad that I won't need any anti-nausea medications or a wig for this year's ceremony because Herceptin is not so caustic as the chemo-cocktail I was on a year ago. I'm also glad that I can go at all and am sure to shed a few more tears at how grown-up M and her classmates all look in their clean new uniforms. Next Tuesday I'll get an x-ray before my fifth treatment to monitor how the regime is working. I'm hoping that it is doing the wonderful things that I've heard it has done. If not...the next step will be to add another drug to the infusion, probably one called Navelbine, and get the hats and wigs out again for a while. I am comforted by the fact that there are options that I may try yet but am still hoping that the easy to deal with (physically anyway) Herceptin is working its magic. I'm also comforted by all the support I've been receiving through my cyber groups, emotional and financial.